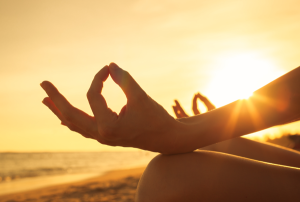 Calm your body and breath: Our mind, body and breath are interconnected, so relaxing the body and calming the breath will naturally calm the mind as well. The parasympathetic nervous system gets activated, and as a result the stress response will be down regulated. This is why, in yoga, one works with postures (asanas) and breathing regulation (pranayama). You can try one of two things – 1.) Sit and take three to five full breaths, breathing in through the nose and out through the mouth. Make them as long, even and deep as possible. When you breathe in, center yourself in the present moment. When you breathe out, consciously make the effort to relax all the muscles in your body, letting go of all tension. Pay special attention to the jaw, throat, tongue and forehead. 2.) Take 5 to 10 minutes to do asanas to relax the body, then five minutes of breathing in through the nose for 4 seconds, then breathing out through the nose for 8 seconds. The aim is for the exhalation to be two times longer than the inhalation. Breathing should be soft, even, and as soundless as possible. Bring happy thoughts and positivity to the mind: Our brains are wired to avoid pain and seek pleasure. If you can generate stable feelings of safety and contentment prior to your meditation, you are sending a message to your brain that all is Ok and it can relax. When our minds are content, they are naturally quieter. Try remembering something you are thankful for, remember the pleasurable feeling of meditation (if you have experienced it before), thank yourself for taking the time to grow and master your mind, say a short prayer to set a mood of centeredness. During meditation, do not get upset with yourself if you get distracted and find delight in moments of pure focus. After meditation, move out of the meditative state gently and take notes in a notebook or journal to keep track of your progress.